SINCE you, O Sophist, everywhere abuse me with such fatuous and mendacious words, on the ground that being sprung from rude Helvetia I can understand and know nothing: and also because being a duly qualified physician I still wander from one district to another; therefore I have proposed by means of this treatise to disclose to the ignorant and inexperienced: what good arts existed in the first age; what my art avails against you and yours against me; what should be thought of each, and how my posterity in this age of grace will imitate me. Look at Hermes, Archelaus, and others in the first age: see what Spagyrists and what Philosophers then existed. By this they testify that their enemies, who are your patrons, O Sophist, at the present time are but mere empty forms and idols. Although this would not be attested by those who are falsely considered your authentic fathers and saints, yet the ancient Emerald Table shews more art and experience in Philosophy, Alchemy, Magic, and the like, than could ever be taught by you and your crowd of followers. If you do not yet understand, from the aforesaid facts, what and how great treasures these are, tell me why no prince or king was ever able to subdue the Egyptians. Then tell me why the Emperor Diocletian ordered all the Spagyric books to be burnt (so far as he could lay his hands upon them). Unless the contents of those books had been known, they would have been obliged to bear still his intolerable yoke, – a yoke, O Sophist, which shall one day be put upon the neck of yourself and your colleagues. From the middle of this age the Monarchy of all the Arts has been at length derived and conferred on me, Theophrastus Paracelsus, Prince of Philosophy and of Medicine. For this purpose I have been chosen by God to extinguish and blot out all the phantasies of elaborate and false works, of delusive and presumptuous words, be they the words of Aristotle, Galen, Avicenna, Mesva, or the dogmas of any among their followers. My theory, proceeding as it does from the light of Nature, can never, through its consistency, pass away or be changed: but in the fifty-eighth year after its millennium and a half it will then begin to flourish. The practice at the same time following upon the theory will be proved by wonderful and incredible signs, so as to be open to mechanics and common people, and they will thoroughly understand how firm and immovable is that Paracelsic Art against the triflings of the Sophists: though meanwhile that sophistical science has to have its ineptitude propped up and fortified by papal and imperial privileges. In that I am esteemed by you a mendicant and vagabond sophist, the Danube and the Rhine will answer that accusation, though I hold my tongue. Those calumnies of yours falsely devised against me have often displeased many courts and princes, many imperial cities, the knightly order, and the nobility. I have a treasure hidden in a certain city called Weinden, belonging to Forum Julii, at an inn, – a treasure which neither you, Leo of Rome, nor you, Charles the German, could purchase with all your substance. Although the signed star has been applied to the arcanum of your names, it is known to none but the sons of the divine Spagyric Art. So then, you wormy and lousy Sophist, since you deem the monarch of arcana a mere ignorant, fatuous, and prodigal quack, now, in this mid age, I determine in my present treatise to disclose the honourable course of procedure in these matters, the virtues and preparation of the celebrated Tincture of the Philosophers for the use and honour of all who love the truth, and in order that all who despise the true arts may be reduced to poverty. By this arcanum the last age shall be illuminated clearly and compensated for all its losses by the gift of grace and the reward of the spirit of truth, so that since the beginning of the world no similar germination of the intelligence and of wisdom shall ever have been heard of. In the meantime, vice will not be able to suppress the good, nor will the resources of those vicious persons, many though they be, cause any loss to the upright. �THE BOOK CONCERNING THE TINCTURE OF THE PHILOSOPHERS. CHAPTER I. I, PHILIPPUS Theophrastus Paracelsus Bombast, say that, by Divine grace, many ways have been sought to the Tincture of the Philosophers, which finally all came to the same scope and end. Hermes Trismegistus, the Egyptian, approached this task in his own method. Orus, the Greek, observed the same process. Hali, the Arabian, remained firm in his order. But Albertus Magnus, the German, followed also a lengthy process. Each one of these advanced in proportion to his own method; nevertheless, they all arrive at one and the same end, at a long life, so much desired by the philosophers, and also at an honourable sustenance and means of preserving that life in this Valley of Misery. Now at this time, I, Theophrastus Paracelsus Bombast, Monarch of the Arcana, am endowed by God with special gifts for this end, that every searcher after this supreme philosophic work may be forced to imitate and to follow me, be he Italian, Pole, Gaul, German, or whatsoever or whosoever he be. Come hither after me, all you philosophers, astronomers, and spagyrists, of however lofty a name ye may be, I will show and open to you, Alchemists and Doctors, who are exalted by me with the most consummate labours, this corporeal regeneration. I will teach you the tincture, the arcanum1, the quintessence, wherein lie hid the foundations of all mysteries and of all works. For every person may and ought to believe in another only in those matters, which he has tried by fire. If any one shall have brought forward anything contrary to this method of experimentation in the Spagyric Art or in Medicine, there is no reason for your belief in him, since, experimentally, through the agency of fire, the true is separated from the false. The light of Nature indeed is created in this way, that by means thereof the proof or trial of everything may appear, but only to those who walk in this light. With this light we will teach, by the very best methods of demonstration, that all those who before me have approached this so difficult province with their own fancies and acute speculations have, to their own loss, incurred the danger of their foolishness. On which account, from my standpoint, many rustics have been ennobled; but, on the other hand, through the speculative and opinionative art of these many nobles have been changed into clowns, and since they carried golden mountains in their head before they had put their hand to the fire. First of all, then, there must be learnt – digestions, distillations, sublimations, reverberations, extractions, solutions, coagulations, fermentations, fixations, and every instrument which is requisite for this work must be mastered by experience, such as glass vessels, cucurbites, circulators, vessels of Hermes, earthen vessels, baths, blast-furnaces, reverberatories, and instruments of like kind, also marble, coals, and tongs. Thus at length you will be able to profit in Alchemy and in Medicine. But so long as, relying on fancy and opinion, you cleave to your fictitious books, you are fitted and predestinated for no one of these things. CHAPTER II. CONCERNING THE DEFINITION OF THE SUBJECT AND MATTER OF THE TINCTURE OF THE PHILOSOPHERS. Before I come, then, to the process of the Tincture, it is needful that I open to you the subject thereof: for, up to the present time, this has always been kept in a specially occult way by the lovers of truth. So, then, the matter of the Tincture (when you understand me in a Spagyrical sense) is a certain thing which, by the art of Vulcan2, passes out of three essences into one essence, or it may remain. But, that I may give it its proper name, according to the use of the ancients, though it is called by many the Red Lion, still it is known by few. This, by the aid of Nature and the skill of the Artist himself, can be transmuted into a White Eagle, so that out of one two are produced; and beyond this the brightness of gold does not shine so much for the Spagyrist as do these two when kept in one. Now, if you do not understand the use of the Cabalists and the old astronomers, you are not born by God for the Spagyric art, or chosen by Nature for the work of Vulcan, or created to open your mouth concerning Alchemical Arts. The matter of the Tincture, then, is a very great pearl and a most precious treasure, and the noblest thing next to the manifestation of the Most High and the consideration of men which can exist upon earth. This is the Lili of Alchemy and of Medicine, which the philosophers have so diligently sought after, but, through the failure of entire knowledge and complete preparation, they have not progressed to the perfect end thereof. By means of their investigations and experiments, only the initial stage of the Tincture has been given to us; but the true foundation, which my colleagues must imitate, has been left for me, so that no one should mingle their shadows with our good intentions. I, by right after my long experiences, correct the Spagyrists, and separate the false or the erroneous from the true, since, by long investigations, I have found reasons why I should be able justly to blame and to change diverse things. If, indeed, I had found out experiments of the ancients better than my own, I should scarcely have taken up such great labours as, for the sake, the utility, and the advantage of all good Alchemists, I have undergone willingly. Since, then, the subject of the Tincture has been sufficiently declared, so that it scarcely could or ought to be exceeded in fidelity between two brothers, I approach its preparation, and after I have laid down the experiences of the first age, I wish to add my own inventions; to which at last the Age of Grace will by-and-by give its adhesion, whichever of the patriarchs, O Sophist, you, in the meantime, shall have made leaders.�CHAPTER III. CONCERNING THE PROCESS OF THE ANCIENTS FOR THE TINCTURE OF THE PHILOSOPHERS, AND A MORE COMPENDIOUS METHOD BY PARACELSUS. The old Spagyrists putrefied Lili for a philosophical month, and afterwards distilled therefrom the moist spirits, until at length the dry spirits were elevated. They again imbued the caput mortuum with moist spirits, and drew them off from it frequently by distillation until the dry spirits were all elevated. Then afterwards they united the moisture that had been drawn off and the dry spirits by means of a pelican, three or four times, until the whole Lili remained dry at the bottom. Although early experience gave this process before fixation, none the less our ancestors often attained a perfect realisation of their wish by this method. They would, however, have had a shorter way of arriving at the treasure of the Red Lion if they had learnt the agreement of Astronomy with Alchemy, as I have demonstrated it in the Apocalypse of Hermes3. But since every day (as Christ says for the consolation of the faithful) has its own peculiar care, the labour for the Spagyrists before my times has been great and heavy; but this, by the help of the Holy Spirit flowing into us, will, in this last age, be lightened and made clear by my theory and practice, for all those who constantly persevere in their work with patience. For I have tested the properties of Nature, its essences and conditions, and I know its conjunction and resolution, which are the highest and greatest gift for a philosopher, and never understood by the sophists up to this time. When, therefore, the earliest age gave the first experience of the Tincture, the Spagyrists made two things out of one simple. But when afterwards, in the Middle Age, this invention had died out, their successors by diligent scrutiny afterwards came upon the two names of this simple, and they named it with one word, namely, Lili, as being the subject of the Tincture. At length the imitators of Nature putrefied this matter at its proper period just like the seed in the earth, since before this corruption nothing could be born from it, nor any arcanum break forth from it. Afterwards they drew off the moist spirits from the matter, until at length, by the violence of the fire, the dry were also equally sublimated, so that, in this way, just as the rustic does at the proper time of year, they might come to maturity as one after another is wont to ascend and to fall away. Lastly, as after the spring comes summer, they incorporated those fruits and dry spirits, and brought the Magistery of the Tincture to such a point that it came to the harvest, and laid itself out for ripening.�CHAPTER IV. CONCERNING THE PROCESS FOR THE TINCTURE OF THE PHILOSOPHERS, AS IT IS SHORTENED BY PARACELSUS. The ancient Spagyrists would not have required such lengthened labour and such wearisome repetition if they had learnt and practised their work in my school. They would have obtained their wish just as well, with far less expense and labour. But at this time, when Theophrastus Paracelsus has arrived as the Monarch of Arcana, the opportunity is at hand for finding out those things which were occult to all Spagyrists before me. Wherefore I say, Take only the rose-coloured blood from the Lion and the gluten from the Eagle. When you have mixed these, coagulate them according to the old process, and you will have the Tincture of the Philosophers, which an infinite number have sought after and very few have found. Whether you will or not, sophist, this Magistery is in Nature itself, a wonderful thing of God above Nature, and a most precious treasure in this Valley of Sorrows. If you look at it from without it seems a paltry thing to transmute another into something far more noble than it was before. But you must, nevertheless, allow this, and confess that it is a miracle produced by the Spagyrist, who by the art of his preparation corrupts a visible body which is externally vile, from which he excites another most noble and most precious essence. If you, in like manner, have learnt anything from the light of Aristotle, or from us, or from the rules of Serapio, come forth, and bring that knowledge experimentally to light. Preserve now the right of the Schools, as becomes a lover of honour and a doctor. But if you know nothing and can do nothing, why do you despise me as though I were an irrational Helvetian cow, and inveigh against me as a wandering vagabond? Art is a second Nature and a universe of its own, as experience witnesses, and demonstrates against you and your idols. Sometimes, therefore, the Alchemist compounds certain simples, which he afterwards corrupts according to his need, and prepares thence another thing. For thus very often out of many things one is made, which effects more than Nature of herself can do, as in Gastaynum it is perfectly well known that Venus is produced from Saturn; in Carinthia, Luna out of Venus; and in Hungary, Sol out of Luna; to pass over in silence for the time being the transmutations of other natural objects, which were well known to the Magi, and more wonderfully than Ovid narrates in his Metamorphoses do they come to the light. That you may rightly understand me, seek your Lion in the East, and your Eagle in the South, for this our work which has been undertaken. You will not find better instruments than Hungary and Istria produce. But if you desire to lead from unity by duality in trinity with equal permutation of each, then you should direct your journey to the South; so in Cyprus shall you gain all your desire, concerning which we must not dilate more profusely than we have done at present. There are still many more of these arcana which exhibit transmutations, though they are known to few. And although these may by the Lord God be made manifest to anyone, still, the rumour of this Art does not on that account at once break forth, but the Almighty gives therewith the understanding how to conceal these and other like arts even to the coming of Elias the Artist, at which time there shall be nothing so occult that it shall not be revealed. You also see with your eyes (though there is no need to speak of these things, which may be taken derisively by some) that in the fire of Sulphur is a great tincture for gems, which, indeed, exalts them to a loftier degree than Nature by herself could do. But this gradation of metals and gems shall be omitted by me in this place, since I have written sufficiently about it in my Secret of Secrets, in my book on the Vexations of Alchemists, and abundantly elsewhere. 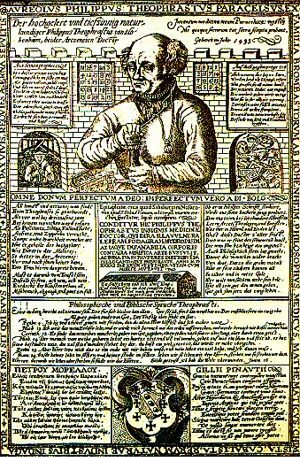 As I have begun the process of our ancestors with the Tincture of the Philosophers, I will now perfectly conclude it.�CHAPTER V. CONCERNING THE CONCLUSION OF THE PROCESS OF THE ANCIENTS, MADE BY PARACELSUS. Lastly, the ancient Spagyrists having placed Lili in a pelican and dried it, fixed it by means of a regulated increase of the fire, continued so long until from blackness, by permutation into all the colours, it became red as blood, and therewith assumed the condition of a salamander. Rightly, indeed, did they proceed with such labour, and in the same way it is right and becoming that everyone should proceed who seeks this pearl. It will be very difficult for me to make this clearer to you unless you shall have learnt in the School of the Alchemists to observe the degrees of the fire, and also to change your vessels. For then at length you will see that soon after your Lili shall have become heated in the Philosophic Egg, it becomes, with wonderful appearances, blacker than the crow; afterwards, in succession of time, whiter than the swan; and at last, passing through a yellow colour, it turns out more red than any blood. Seek, seek, says the first Spagyrist, and you shall find; knock, and it shall be opened unto you. It would be impious and indecorous to put food in the mouth of a perfidious bird. Let her rather fly to it, even as I, with others before me, have been compelled to do. But follow true Art; for this will lead you to its perfect knowledge. It is not possible that anything should here be set down more fully or more clearly than I have before spoken. Let your Pharisaical schools teach you what they will from their unstable and slippery foundation, which reaches not its end or its aim. When at length you shall have been taught as accurately as possible the Alchemistic Art, nothing in the nature of things shall then at length be so difficult which cannot be made manifest to you by the aid of this Art. Nature, indeed, herself does not bring forth anything into the light which is advanced to its highest perfection, as can be seen in this place from the unity, or the union, of our duality. But a man ought by Spagyric preparations to lead it thither where it was ordained by Nature. Let this have been sufficiently said by me, concerning the process of the ancients and my correction of the Tincture of the Philosophers, so far as relates to its preparation. Moreover, since now we have that treasure of the Egyptians in our hands, it remains that we turn it to our use: and this is offered to us by the Spagyric Magistery in two ways. According to the former mode it can be applied for the renewing of the body; according to the latter it is to be used for the transmutation of metals. Since, then, I, Theophrastus Paracelsus, have tried each of them in different ways, I am willing to put them forward and to describe them according to the signs indeed of the work, and as in experience and proof they appeared to me better and more perfectly. CHAPTER VI. CONCERNING THE TRANSMUTATION OF METALS BY THE PERFECTION OF MEDICINE. If the Tincture of the Philosophers is to be used for transmutation, a pound of it must be projected on a thousand pounds of melted Sol. Then, at length, will a Medicine have been prepared for transmuting the leprous moisture of the metals. This work is a wonderful one in the light of Nature, namely, that by the Magistery, or the operation of the Spagyrist, a metal, which formerly existed, should perish, and another be produced. This fact has rendered that same Aristotle, with his ill-founded philosophy, fatuous. For truly, when the rustics in Hungary cast iron at the proper season into a certain fountain, commonly called Zifferbrunnen, it is consumed into rust, and when this is liquefied with a blast-fire, it soon exists as pure Venus, and never more returns to iron. Similarly, in the mountain commonly called Kuttenberg, they obtain a lixivium out of marcasites, in which iron is forthwith turned into Venus of a high grade, and more malleable than the other produced by Nature. These things, and more like them, are known to simple men rather than to sophists, namely, those which turn one appearance of a metal into another. And these things, moreover, through the remarkable contempt of the ignorant, and partly, too, on account of the just envy of the artificers, remain almost hidden. But I myself, in Istria, have often brought Venus to more than twenty-four (al. 38) degrees, so that the colour of Sol could not mount higher, consisting of Antimony or or Quartal, which Venus I used in all respects as other kinds. But though the old artists were very desirous of this arcanum, and sought it with the greatest diligence, nevertheless, very few could bring it by means of a perfect preparation to its end. For the transmutation of an inferior metal into a superior one brings with it many difficulties and obstacles, as the change of Jove into Luna, or Venus into Sol. Perhaps on account of their sins God willed that the Magnalia of Nature should be hidden from many men. For sometimes, when this Tincture has been prepared by artists, and they were not able to reduce their projection to work its effects, it happened that, by their carelessness and bad guardianship, this was eaten up by fowls, whose feathers thereupon fell off, and, as I myself have seen, grew again. In this way transmutation, through its abuse from the carelessness of the artists, came into Medicine and Alchemy. For when they were unable to use the Tincture according to their desire, they converted the same to the renovation of men, as shall be heard more at large in the following chapter. CHAPTER VII. CONCERNING THE RENOVATION OF MEN. Some of the first and primitive philosophers of Egypt have lived by means of this Tincture for a hundred and fifty years. The life of many, too, has been extended and prolonged to several centuries, as is most clearly shewn in different histories, though it seems scarcely credible to any one. For its power is so remarkable that it extends the life of the body beyond what is possible to its congenital nature, and keeps it so firmly in that condition that it lives on in safety from all infirmities. And although, indeed, the body at length comes to old age, nevertheless, it still appears as though it were established in its primal youth. So, then, the Tincture of the Philosophers is a Universal Medicine, and consumes all diseases, by whatsoever name they are called, just like an invisible fire. The dose is very small, but its effect is most powerful. By means thereof I have cured the leprosy, venereal disease, dropsy, the falling sickness, colic, scab, and similar afflictions; also lupus, cancer, noli-me-tangere, fistulas, and the whole race of internal diseases, more surely than one could believe. Of this fact Germany, France, Italy, Poland, Bohemia, etc., will afford the most ample evidence. � HERE ENDS THE BOOK CONCERNING THE TINCTURE OF THE PHILOSOPHERS. NOTES 1 The Arcanum of a substance is not the virtue (virtus) but the essence (vir) and the potency (potentia), and is stronger than the virtue; nevertheless, an old error of the doctors conferred the name of virtues upon the potential essences. – Paramirum, Lib. IV. Many things are elsewhere set forth concerning the Quintessence, but what is described is really a separation or extraction of the pure from the impure, not a true quintessence, and it is more correctly termed an Arcanum. –Explicatio Totius Astronomiae. 2 The office of Vulcan is the separation of the good from the bad. So the Art of Vulcan, which is Alchemy, is like unto death, by which the eternal and the temporal are divided one from another. So also this art might be called the death of things. – De Morbis Metallicis, Lib. I., Tract III., c. 1. Vulcan is an astral and not a corporal fabricator. – De Caduco Matricis, Par. VI. The artist working in metals and other minerals transforms them into other colours, and in so doing his operation is like that of the heaven itself. For as the artist excocts by means of Vulcan, or the igneous element, so heaven performs the work of coction through the Sun. The Sun, therefore, is the Vulcan of heaven accomplishing coction in the earth. – De Icteritiis. Vulcan is the fabricator and architect of all things, nor is his habitation in heaven only, that is, in the firmament, but equally in all the other elements. – Lib. Meteorum, c. 4. Where the three prime principles are wanting, there also the igneous essence is absent. The Igneous Vulcan is nothing else but Sulphur, Sal Nitrum, and Mercury. – Ibid., c.5. 3 The Book of the Revelation of Hermes, interpreted by Theophrastus Paracelsus, concerning the Supreme Secret of the World, seems to have been first brought to light by Benedictus Figulus, and appeared as a piece de r�sistance in his “Golden and Blessed Casket of Nature’s Marvels”, of which an English translation has been very recently published. (“A Golden and Blessed Casket of Nature’s Marvels”. By Benedictus Figulus. Now first done into English from the German original published at Frankfort in the year 1608. London: James Elliott and Co. 8vo., 1893). Among the many writings which have been fabulously attributed to Hermes, there does not seem to be any record of an apocalypse, and it is impossible to say what forged document may have been the subject of interpretation by Paracelsus. As the collection of Figulus is now so readily accessible, it is somewhat superfluous to reproduce the treatise here, but since this translation claims to include everything written by the physician of Hohenheim on the subject of Alchemy and the Universal Medicine, it is appended at this point. It should be premised that Benedictus Figulus complains bitterly of the mutilation and perversion to which the works of Paracelsus were subjected, and the Revelation of Hermes seems in many parts to betray another hand, especially in its quotation of authorities who are not countenanced by its reputed author. Hermes, Plato, Aristotle, and other philosophers, flourishing at different times, who have introduced the Arts, and more especially have explored the secrets of inferior Creation, all these have eagerly sought a means whereby man’s body might be preserved from decay and become endued with immortality. To them it was answered that there is nothing which might deliver the mortal body from death; but that there is One Thing which may postpone decay, renew youth; and prolong short human life (as with the patriarchs). For death was laid as a punishment upon our first parents, Adam and Eve, and will never depart from all their descendants. Therefore, the above philosophers, and many others, have sought this One Thing with great labour, and have found that that which preserves the human body from corruption, and prolongs life, conducts itself, with respect to other elements, as it were like the Heavens; from which they understood that the Heavens are a substance above the Four Elements. And just as the Heavens, with respect to the other elements, are held to be the fifth substance (for they are indestructible, stable, and suffer no foreign admixture), so also this One Thing (compared to the forces of our body) is an indestructible essence, drying up all the superfluities of our bodies, and has been philosophically called by the above-mentioned name. It is neither hot and dry like fire, nor cold and moist like water, nor warm and moist like air, nor dry and cold like earth. But it is a skilful, perfect equation of all the Elements, a right commingling of natural forces, a most particular union of spiritual virtues, an indissoluble uniting of body and soul. It is the purest and noblest substance of an indestructible body, which cannot be destroyed nor harmed by the Elements, and is produced by Art. With this, Aristotle prepared an apple, prolonging life by its scent, when he, fifteen days before his death, could neither eat nor drink on account of old age. This spiritual Essence, or One Thing, was revealed from above to Adam, and was greatly desired by the Holy Fathers; this also Hermes and Aristotle call the Truth without Lies, the most sure of all things certain, the Secret of all Secrets. It is the Last and the Highest Thing to be sought under the Heavens, a wondrous closing and finish of philosophical work, by which are discovered the dews of Heaven and the fastnesses of Earth. What the mouth of man cannot utter is all found in this spirit. As Morienus says: “He who has this has all things, and wants no other aid. For in it are all temporal happiness, bodily health, and earthly fortune. It is the spirit of the fifth substance, a Fount of all Joys ( beneath the rays of the moon), the Supporter of Heaven and Earth, the Mover of Sea and Wind, the Outpourer of Rain, upholding the strength of all things, an excellent spirit above Heavenly and other spirits, giving Health, Joy, Peace, Love; driving away Hatred and Sorrow, bringing in Joy, expelling all Evil, quickly healing all Diseases, destroying Poverty and misery, leading to all good things, preventing all evil words and thoughts, giving man his heart’s desire, bringing to the pious earthly honour and long life, but to the wicked who misuse it, Eternal Punishment”. This is the Spirit of Truth, which the world cannot comprehend without the interposition of the Holy Ghost, or without the instruction of those who know it. The same is of a mysterious nature, wondrous strength, boundless power. The Saints, from the beginning of the world, have desired to behold its face. By Avicenna this Spirit is named the Soul of the World. For, as the Soul moves all the limbs of the body, so also does this Spirit move all bodies. And as the Soul is in all the limbs of the Body, so also is this Spirit in all elementary created things. It is sought by many and found by few. It is beheld from afar and found near; for it exists in every thing, in every place, and at all times. It has the powers of all creatures; its action is found in all elements, and the qualities of all things are therein, even in the highest perfection. By virtue of this essence did Adam and the Patriarchs preserve their health and live to an extreme age, some of them also flourishing in great riches. When the philosophers had discovered it, with great diligence and labour, they straightway concealed it under a strange tongue, and in parables, lest the same should become known to the unworthy, and the pearls be cast before swine. For if everyone knew it, all work and industry would cease; man would desire nothing but this one thing, people would live wickedly, and the world be ruined, seeing that they would provoke God by reason of their avarice and superfluity. For eye hath not seen, nor ear heard, nor hath the heart of man understood what Heaven hath naturally incorporated with this Spirit. Therefore have I briefly enumerated some of the qualities of this Spirit, to the Honour of God, that the pious may reverently praise Him in His gifts (which gift of God shall afterwards come to them), and I will herewith shew what powers and virtues it possesses in each thing, also its outward appearance, that it may be more readily recognised. In its first state, it appears as an impure earthly body, full of imperfections. It then has an earthly nature, healing all sickness and wounds in the bowels of man, producing good and consuming proud flesh, expelling all stench, and healing generally, inwardly and outwardly. In its second nature, it appears as a watery body, somewhat more beautiful than before, because (although still having its corruptions) its Virtue is greater. It is much nearer the truth, and more effective in works. In this form it cures cold and hot fevers and is a specific against poisons, which it drives from heart and lungs, healing the same when injured or wounded, purifying the blood, and, taken three times a day, is of great comfort in all diseases. But in its third nature it appears as an aerial body, of an oily nature, almost freed from all imperfections, in which form it does many wondrous works, producing beauty and strength of body, and (a small quantity being taken in the food) preventing melancholy and heating of the gall, increasing the quantity of the blood and seed, so that frequent bleeding becomes necessary. It expands the blood vessels, cures withered limbs, restores strength to the sight, in growing persons removes what is superfluous and makes good defects in the limbs. In its fourth nature it appears in a fiery form (not quite freed from all imperfections, still somewhat watery and not dried enough), wherein it has many virtues, making the old young and reviving those at the point of death. For if to such an one there be given, in wine, a barleycorn’s weight of this fire, so that it reach the stomach, it goes to his heart, renewing him at once, driving away all previous moisture and poison, and restoring the natural heat of the liver. Given in small doses to old people, it removes the diseases of age, giving the old young hearts and bodies. Hence it is called the Elixir of Life. In its fifth and last nature, it appears in a glorified and illuminated form, without defects, shining like gold and silver, wherein it possesses all previous powers and virtues in a higher and more wondrous degree. Here its natural works are taken for miracles. When applied to the roots of dead trees they revive, bringing forth leaves and fruit. A lamp, the oil of which is mingled with this spirit, continues to burn for ever without diminution. It converts crystals into the most precious stones of all colours, equal to those from the mines, and does mayn other incredible wonders which may not be revealed to the unworthy. For it heals all dead and living bodies without other medicine. Here Christ is my witness that I lie not, for all heavenly influences are united and combined therein. This essence also reveals all treasures in earth and sea, converts all metallic bodies into gold, and there is nothing like unto it under Heaven. This spirit is the secret hidden from the beginning, yet granted by God to a few holy men for the revealing of these iches to His Glory – dwelling in fiery form in the air, and leading earth with itself to heaven, while from its body there flow whole rivers of living water. This spirit flies through the midst of the Heavens like a morning mist, leads its burning fire into the water, and has its shining realm in the heavens. And although these writings may be regarded as false by the reader, yet to the initiated they are true and possible, when the hidden sense is properly understood. For God is wonderful in His works, and His wisdom is without end. This spirit in its fiery form is called a Sandaraca, in the aerial a Kybrick, in the watery an Azoth, in the earthly Alcohoph and Aliocosoph. Hence they are deceived by these names who, seeking without instruction, think to find this Spirit of Life in things foreign to our Art. For although this spirit which we seek, on account of its qualities, is called by these names, yet the same is not in these bodies and cannot be in them. For a refined spirit cannot appear except in a body suitable to its nature. And, by however many names it be called, let no one imagine there be different spirits, for, say what one will, there is but one spirit working everywhere and in all things. That is the spirit which, when rising, illumines the Heavens, when setting incorporates the purity of Earth, and when brooding has embraced the Waters. This spirit is named Raphael, the Angel of God, the subtlest and purest, whom the others all obey as their King. This spiritual substance is neither heavenly nor hellish, but an airy, pure, and hearty body, midway between the highest and lowest, without reason, but fruitful in works, and the most select and beautiful of all other heavenly things. This work of God is far too deep for understanding, for it is the last, greatest, and highest secret of Nature. It is the Spirit of God, which in the Beginning filled the earth and brooded over the waters, which the world cannot grasp without the gracious interposition of the Holy Spirit and instruction from those who know it, which also the whole world desires for its virtue, and which cannot be prized enough. For it reaches to the planets, raises the clouds, drives away mists, gives its light to all things, turns everything into Sun and Moon, bestows all health and abundance of treasure, cleanses the leper, brightens the eyes, banishes sorrow, heals the sick, reveals all hidden treasures, and, generally, cures all diseases. Through this spirit have the philosophers invented the Seven Liberal Arts, and thereby gained their riches. Through the same Moses made the golden vessels in the Ark, and King Solomon did many beautiful works to the honour of God. Therewith Moses built the Tabernacle, Noah the Ark, Solomon the Temple. By this, Ezra restored the Law, and Miriam, Moses’ sister, was hospitable; Abraham, Isaac, and Jacob, and other righteous men, have had lifelong abundance and riches; and all the saints possessing it have therewith praised God. Therefore is its acquisition very hard, more than that of gold and silver. For it is the best of all things, because, of all things mortal that man can desire in this world, nothing can compare with it, and in it alone is truth. Hence it is called the Stone and Spirit of Truth; in its works is no vanity, its praise cannot be sufficiently expressed. I am unable to speak enough of its virtues, because its good qualities and powers are beyond human thoughts, unutterable by the tongue of man, and in it are found the properties of all things. Yea, there is nothing deeper in Nature. O unfathomable abyss of God’s Wisdom, which thus hath united and comprised in the virtue and power of this One Spirit the qualities of all existing bodies! O unspeakable honour and boundless joy granted to mortal man! For the destructible things of Nature are restored by virtue of the said Spirit. O mystery of mysteries, most secret of all secret things, and healing and medicine of all things! Thou last discovery in earthly natures, last best gift to Patriarchs and Sages, greatly desired by the whole world! Oh, what a wondrous and laudable spirit is purity, in which stand all joy, riches, fruitfulness of life, and art of all arts, a power which to its initiates grants all material joys! O desirable knowledge, lovely above all things beneath the circle of the Moon, by which Nature is strengthened, and heart and limbs are renewed, blooming youth is preserved, old age driven away, weakness destroyed, beauty in its perfection preserved, and abundance ensured in all things pleasing to men! O thou spiritual substance, lovely above all things! O thou wondrous power, strengthening all the world! O thou invincible virtue, highest of all that is, although despised by the ignorant, yet held by the wise in great praise, honour, and glory, that – proceeding from humours – wakest the dead, expellest diseases, restorest the voice of the dying! O thou treasure of treasures, mystery of mysteries, called by Avicenna “an unspeakable substance”, the purest and most perfect soul of the world, than which there is nothing more costly under Heaven, unfathomable in nature and power, wonderful in virtue and works, having no equal among creatures, possessing the virtues of all bodies under Heaven! For from it flow the water of life, the oil and honey of eternal healing, and thus hath it nourished them with honey and water from the rock. Therefore, saith Morienus: “He who hath it, the same also hath all things”. Blessed art Thou, Lord God of our Fathers, in that Thou hast given the prophets this knowledge and understanding, that they have hidden these things (lest they should be discovered by the blind, and those drowned in worldly godlessness) by which the wise and the pious have praised Thee! For the discoverers of the mystery of this thing to the unworthy are breakers of the seal of Heavenly Revelation, thereby offending God’s Majesty, and bringing upon themselves many misfortunes and the punishments of God. Therefore, I beg all Christians, possessing this knowledge, to communicate the same to nobody, except it be to one living in Godliness, of well-proved virtue, and praising God, Who has given such a treasure to man. For many seek, but few find it. Hence the impure and those living in vice are unworthy of it. Therefore is this Art to be shewn to all God-fearing persons, because it cannot be bought with a price. I testify before God that I lie not, although it appear impossible to fools, that no one has hitherto explored Nature so deeply. The Almighty be praised for having created this Art and for revealing it to God-fearing men. Amen. And thus is fulfilled this precious and excellent work, called the revealing of the occult spirit, in which lie hidden the secrets and mysteries of the world. But this spirit is one genius, and divine, wonderful, and lordly power. For it embraces the whole world, and overcomes the Elements and the fifth Substance. To our Trismegistus Spagyrus, Jesus Christ, be praise and glory immortal. Amen.